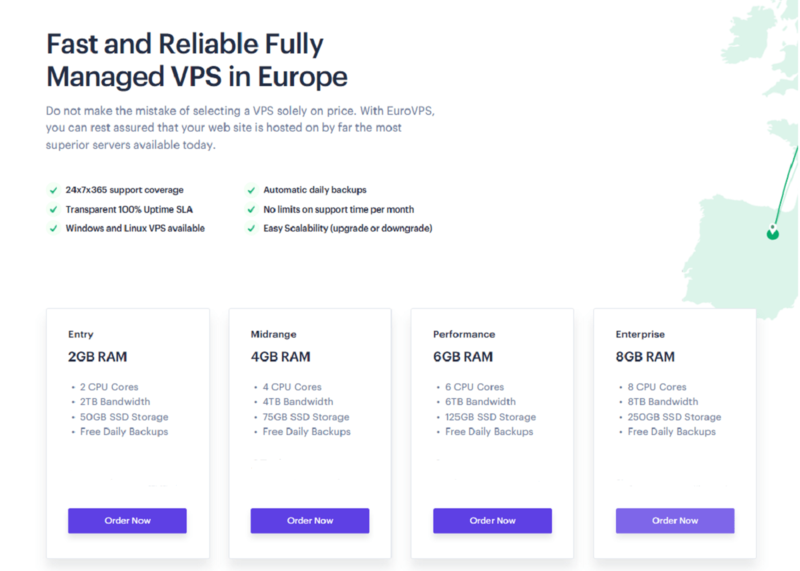 EuroVPS Review 2019: Is EuroVPS a Good Hosting? EuroVPS offers VPS and dedicated server hosting with a 10Gbps uplink and 100% uptime guarantee. They offer free migrations for existing sites along with servers that are capable of running anything you can throw at them. EuroVPS has been offering web hosting solutions since 2004 and presently serves over 2,000 clients in over 100 countries. They aren’t a “low cost” shared hosting solution but rather a robust service offering managed VPS and dedicated servers with fantastic customer support. EuroVPS does not offer shared hosting EuroVPS guarantees 100% uptime and backs that up with credits to your account in the event of an outage of 60 minutes or longer. EuroVPS only offers VPS and dedicated server hosting. Unlike shared hosting, with VPS hosting each server houses only a few sites and offers larger resource allocations for customers. Dedicated hosting allows you to rent the entire server, giving you all of the resources of that server for your website. Unlike shared hosting services, EuroVPS is more targeted to website pros or those experienced enough to manage their sites. That said, it doesn’t mean beginners can’t use it, because their support staff will help walk you through setting up your website. Honestly, if you’re a beginner, you’d be best served by having their support team handle the initial setup. If your website is on another host, you can migrate your site to EuroVPS for free. Their team of engineers will move your site quickly and help you optimize it for performance. Once you’ve decided whether to go with managed VPS or a dedicated server, now you can choose which plan best fits your needs. One difference between dedicated hosting and the managed VPS services is that each plan is customizable. The table above is the base configuration. If you need more power than listed, you can easily upgrade specific aspects of your plan during the checkout process. All plans come with a seven-day money back guarantee. Their guarantee would be better if it were a 30-day money back guarantee. That way you’d have ample time to get your site migrated or built and to conduct testing. All plans with EuroVPS come with unlimited support at no additional cost. What does this mean? This means that whatever issue you have, be it needing help with migrating a database to configuring your cPanel software, customer support is there to assist. EuroVPS works a bit differently than most services. In addition to assisting you with problems, they monitor your key websites and server metrics constantly, and their engineers will be notified of any issues, sometimes fixing them before you’re aware of a problem. They also hold quarterly security audits of their servers and sites to uncover any potential security threats. You can contact customer support 24/7 via live chat or phone Unfortunately, they don’t offer a toll-free option for international customers. Note that their live chat support is run on Intercom and you’ll have to wait about five minutes on average for a reply. When I tried their customer support, their agents were very helpful and knowledgeable. EuroVPS focuses on providing quality web hosting solutions for those needing fast performance and scalability. Whether you choose a managed VPS or a dedicated server, you will have everything you need to run as many websites as you can operate successfully. Wondering how EuroVPS stacks up against other Web Hosting companies? Enter any other Web Hosting company and we will give you a side-by-side comparison.